Mmmm, love the shot with the honey dripping off the spoon! 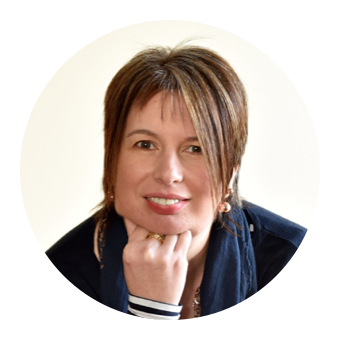 I really enjoyed cooking with Camovita Manuka honey, it's deelish and so good for you! It was so thick it hardly wanted to drip! I'm not a huge fan of honey on its own so it's ideal to incorporate its goodness as a natural sweetener. It is delicious honey, lovely and thick and with such a good flavour. 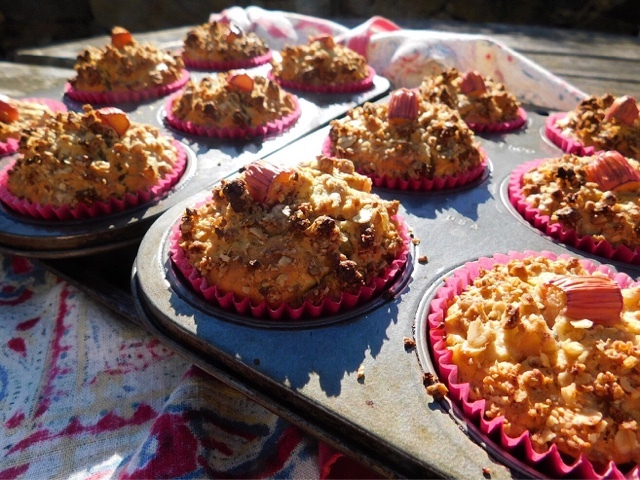 I love the idea of these muffins. My kids were absolutely drooling over it and couldn't believe how thick and full of flavour it was. Teenage boy with hollow legs ate his muffin with a further spoonful of Manuka on the top! 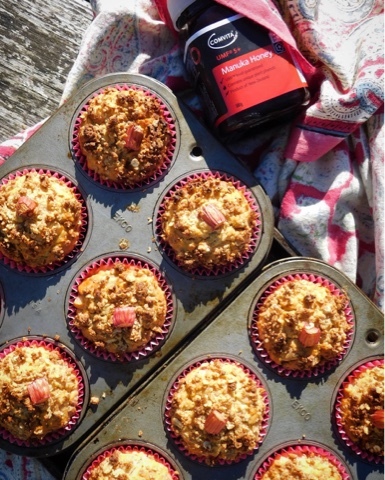 I do love a rhubarb muffin - can't get enough of them, the addition of manuka is genius! I find the story of manuka fascinating, clever bees. Bees in general are just SO clever and the Manuka ones in particular. How do they know what flowers to go to?! Anything rhubarb is good in my book! The pink glow of rhubarb on the supermarket shelf is irresistible, isn't it? Have never tried manuka honey before but it looks like a must! Yes the super early forced Rhubarb is almost an 80's luminescent pink. Can't wait till my crop is ready to harvest. You've so got to try some Manuka Honey. Oh my goodness these sound so yummy! A great way to take care of a sweet tooth and one's healthy at the same time! 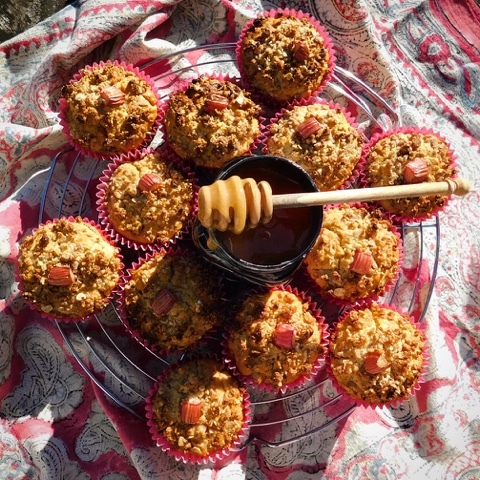 I don't think I've ever cooked with Manuka honey, this recipe would be a venture into new territory for me. Sounds delicious! 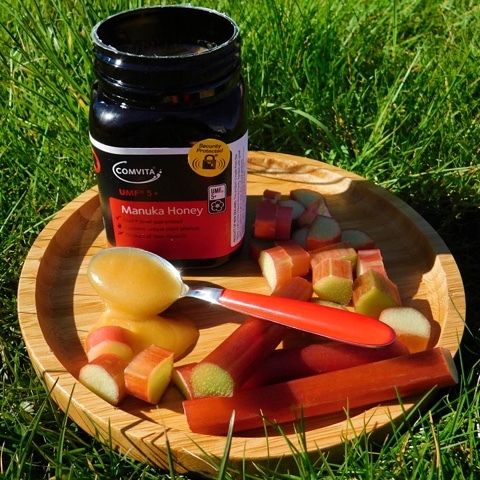 The natural sweetness of the Manuka honey is a perfect combination to have with rhubarb. Rhubarb is delicious, but it does need the right sweetness. Lovely recipe. 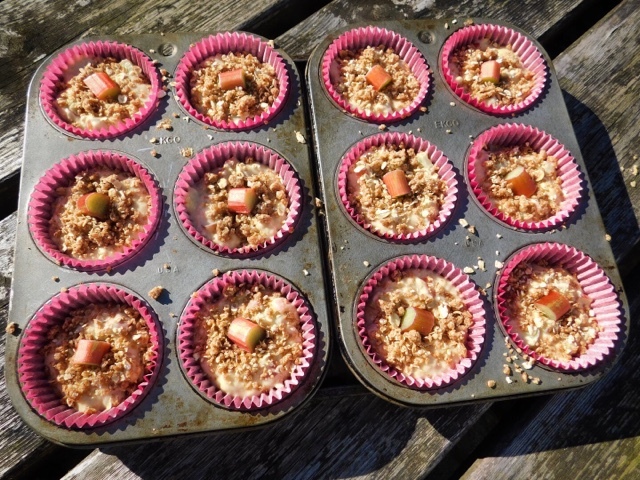 I love Rhubarb, and have never had it with honey, sounds like a winning combo! That honey looks so sticky and lovely! I have never tried rhubarb with honey but I can imagine how well they got together. I love a streusel topping on a muffin too.